Aetrex released their new boot collection for Fall 2011. The Aetrex Berries Boots and Aetrex Essence Boots offer women who seek a comfortable boot that provides great support and comes in several sizes and widths the latest winter fashion styles. The combination of customizable features and stretch fabrics makes these boots one of the healthiest boots around. An Innovative memory foam insole – removable to accommodate orthotics. Pull-up tabs for easy on/off wear. The Bungee Boots come in 5 colors. Berries Tall Boots come in 5 colors. Mid-Calf Boots come in 3 colors. The Aetrex Essence Tall Riding Boot is made with Italian calf skin leather or comes in soft suede upper with comfort sweater knit for warmth and stretchability. The Tall Riding boots feature half-way side zipper for easy on/off wear and 1” leather stacked heel. The Aetrex Essence Tall Wedge Boot features Elastic back gore that stretches to fit wider calves, sealed seams and full-length side zipper for easy on/off use. 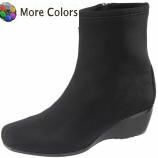 The Aetrex Essence Ankle Boot featurs Italian calf skin leather or four-way stretch upper, side zipper for ease of use and 14/8” wedge for added cushioning & support. Purchase Aetrex Boots from the Orthotic Shop. The Orthotic Shop offers free shipping and great prices on all Aetrex Boots and Aetrex Shoes These boots for orthotics are great for people who don’t even need to wear orthotics because the memory foam insoles will give them all day comfort their feet desire.